You are here: Home / Level 4 - Citizen Science Apps / What kind of leaf is this? What kind of leaf is this? Ever wish you knew your trees better? 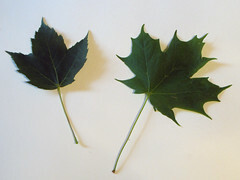 Can’t tell an amur maple from a hedge maple? Never fear, there’s an app for that. Leafsnap is the first of a series of planned “electronic field guides.” A joint venture between Columbia University, University of Maryland, and the Smithsonian Institute, the app is free for the iPhone and the iPad. To use it, snap a picture of the specimen in question, and the app will use use facial recognition technologies to match it against a database of high-resolution images of leaves, flowers, fruit, petiole (the leafstalk), seeds, and bark. Currently, the database contains plants in the northeast United States, but is being expanded daily. Can’t wait for your next field trip to the woods? Have a look at some of the beautiful imagery right here on the web. Organizers also say that an Android version of the app is also in the works.